Follow us on social media for live updates tonight. 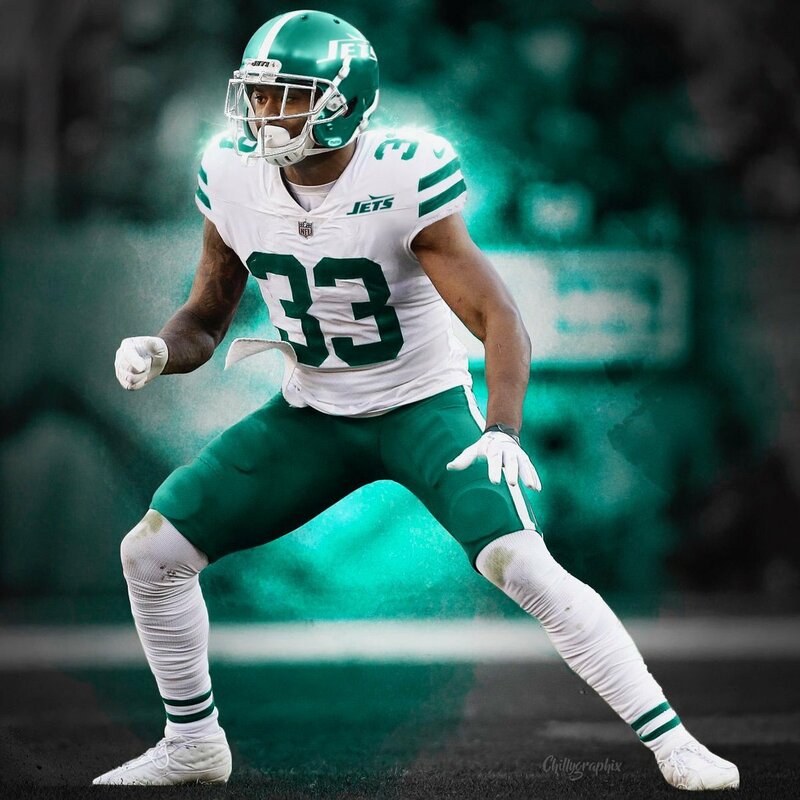 Are new Jets uniforms coming in 2018? A popular hashtag on Twitter has been getting serious momentum over the past few months in regards to new uniforms possibly coming to the New York Jets in 2018. Is it truly happening? If you love Twitter, you’ve undoubtedly seen the hashtag #JetsNewUnis trending here and there. 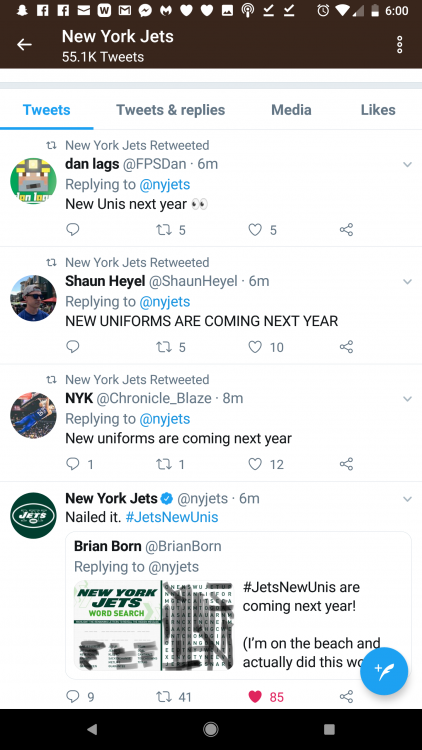 There have been a lot of rumors circulating over the past few months about the New York Jets possibly debuting new uniforms at some point this upcoming season. 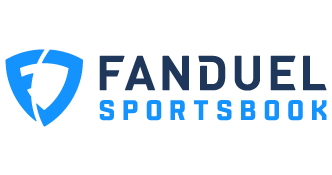 Could the selection of future franchise quarterback Sam Darnold have something to do with the Jets dropping a new look for 2018? It’s no secret that Darnold is likely to start at some point during the regular season but there is a good chance a new uniform or alternate uniform could be a reality due to a very important milestone coming up. 2018 marks the 50th Anniversary of the Jets Super Bowl III championship. Ideally, the Jets will most likely have a lot of home events and giveaways to commemorate the only championship in franchise history. Expect to see the Jets wear perhaps a throwback 1960s jersey for a regular season game to honor the Super Bowl III championship season. Could a hybrid jersey be in the works as well? Perhaps featuring that famous 1960s design but with a more modern look/color? Your guess is as good as mine but as far as a completely new uniform being debuted this season, it wouldn’t make sense. Perhaps maybe in 2019 if the Jets deem Darnold their full-time starter maybe but for 2018, it’s unlikely. It likely revolves around this huge moment in Jets history. Considering it’s the 50th Anniversary of this huge accomplishment by the Jets, expect to see them do a throwback uniform game to hype it all up. It’ll be a huge celebration at MetLife Stadium likely to feature pre-game festivities, a halftime ceremony, and maybe even fireworks too. Kinda stupid of the Jets to say that so early in the game. Who is going to buy a jersey now, knowing this is the last year they will wear it? 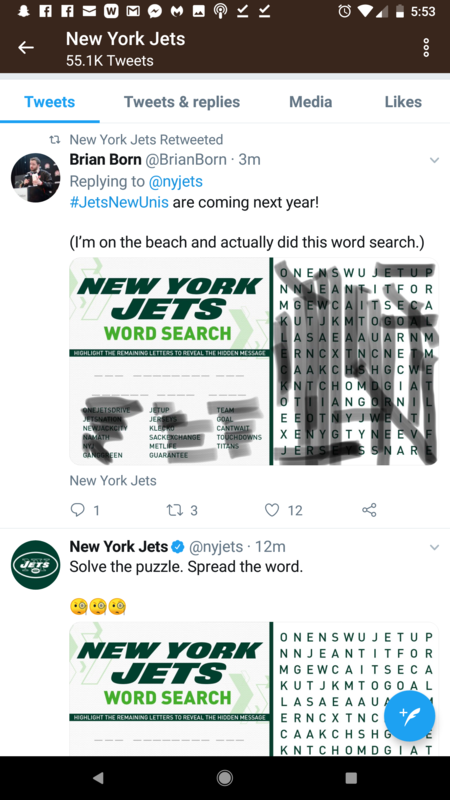 I see right through you NYJ. Trying to distract me from this Darnold situation. I'm still pissed!! ....but they better be fire. Please keep the helmets white. i hope this is it. There were 0 Jets jerseys for sale yesterday at the training camp tent. The Jets will have a brand new look in 2019. The franchise will unveil new uniforms next April and the Jets will wear their ensemble beginning in their 60th season of play. After starting as the Titans of New York and sporting a navy, gold and white combination from 1960-62, the team was renamed the Jets prior to the 1963 season and kelly green and white became synonymous with the upstarts from the American Football League. There have been three major uniform alterations since. The last one came prior to the 1998 campaign when Bill Parcells oversaw a color change from kelly green to hunter green and removed black as an accent color while paying homage to the Super Bowl III championship team with a modified version of the oval on the helmet that was used from 1965-77. Suspense will build in the months prior to a highly anticipated reveal. As far as all the details, we’ll have to wait until April. But change is on the horizon. Note: There will be no changes to the current uniform for the upcoming season. The Jets will wear their “Color Rush” uniforms one time in 2018 as they’ll be in all green when they host the Minnesota Vikings in Week 7. I hope there’s no throwback involved at all. Hate that 80’s logo which basically represented garbage. If they’re going for something new, I hope it’s brand new. And yeah, I also want them to keep the white helmets. New uniforms new quarterback maybe a new outcome. So why get a darnold Jersey this year when you can get a different jersey with a different qb. New HC and GM too! New agents would be cooler. I am all for this! Make it simple, make it clean and make it green. If the Adams pix are the exact ones, sign me up. Yea. It’s currently an abortion. 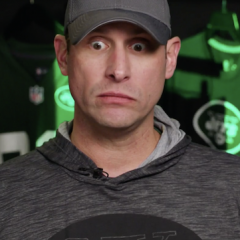 So our qb is holding out and we’re getting new unis in 2019. Can’t wait for this year. Pay no attention to that man behind the curtain! Bleed Green Til I Die! Just paid 300 for a custom one a few weeks ago. Wish I waited. joewilly12 is a new fan. He wakes up and forgets who he cheers for every morning. he’s an older fella’ so ya know. Soooo. That $300 I spent on an authentic Darnold.......where do I get my money back for that? The Jets just put up a short promo video and you catch a glimpse of the jersey at the end. Looks kinda like the old Eagles jerseys, with the skinny lettering. You sure that’s the new jersey?